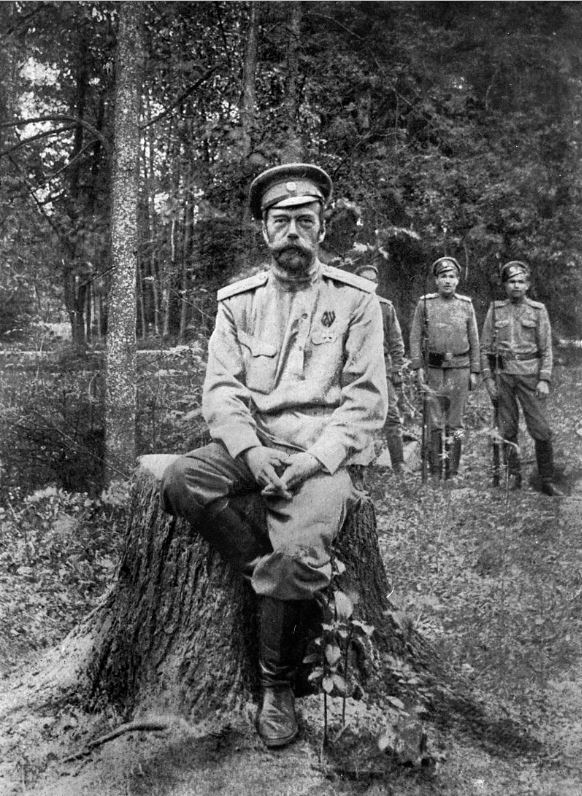 Cheiro and the Czar Ex-Czar Nicholas II after his abdication in March of 1917. Today is the 100th anniversary of the murder of the Romanov family at Yekaterinburg, 17 July 1918. Although today the Romanovs are viewed by many through rose-coloured lorgnettes enamelled by Faberge, the United States papers of the past were quite harsh in their stories of Russian ignorance and brutality, Imperial superstition and of Czar Nicholas’s weak character and inept leadership. Although Spiritualist journals analyzed horoscopes of the Czar (and other royals), but despite the hostility of the press and the outbreak of the Revolution, it is surprising to find that there were few people predicting the Romanov murders either before or after the fact. You’ll find a collection of a few, rather dubious visions in this post. The society palmist “Cheiro,” whom we have met before in a story about his encounter with Mata Hari, claimed that he warned Czar Nicholas of the horrors to come a full decade before the Russian Revolution and that he even gave him a way to escape his unhappy fate. In the course of his career Cheiro held the well-manicured hands of a very elite clientele, and seems to have pulled no punches when he saw doom in those hands. Cheiro tells the story of his encounters with Nicholas in his 1932 memoirs, which included anecdotes from his visit to Russia around 1907. The palmist had a reputation of being uncannily accurate; I leave it to you to judge whether he truly predicted the end of the Imperial family or perhaps embellished his prophecies after the fact. I can now add a little more that may be interesting to my readers in this connection. I related many times in Press interviews how the late King Edward VII, when Prince of Wales, in his library at Marlborough House, got me from six o’clock until eight one evening, to work out for him the birth dates of quite a number of persons without giving me any clues to their positions in life. My visitor did not tell me he was the person the paper referred to, but he took copious notes of my explanations and at the end of the interview paid the usual fee for my time and left. A few weeks later a Russian lady called, and among other things told me that the Czar had called on me lately and that I had profoundly upset him by my predictions. A week later, I was taken out by this Minister to see the Czar’s Summer Palace at Peterhof. He first drove me through the wonderful gardens surrounding it. Below us lay the private yacht with steam up and ready at a moment’s notice if the Czar had reason to escape from the country. “What a terrible way for the Czar to live,” I exclaimed. Just then we passed the famous waterfall of the golden steps, sheets of crystal water flowing over wide steps of beaten gold. What a land of contrasts, I thought. At this moment the motor stopped at the door of the Palace, and an officer of the Imperial Guard met us. After passing through one long corridor after another, we were shown into a beautiful room that looked like a library. At first I thought we were alone, but no. There, seated in an easy chair by the window, was the Czar of All the Russias, looking for all the world like an ordinary English gentleman–and reading The Times, too, from London. I stood still as if riveted to the door. I could not make a mistake–before me was decidedly the same man who had visited me in my consulting-rooms in London many years before. He came forward with his hand out. I bowed, but he took my hand all the same. We walked over to the window and looked out over the gardens and down to the beautiful yacht moored underneath. There was nothing worth recording in the conversation that followed; the three of us smoked Russian cigarettes, one after the other, and as the clock struck eight, a door opened and dinner was announced. At that moment the Czarina entered. She simply bowed to the Minister who was with me, then to me, and we went in to dinner. His Excellency had been right. It was indeed a private dinner and without any ceremony whatever. Her Majesty wore a kind of semi-evening dress, but with no jewels, except one magnificent diamond at her throat. There was nothing extraordinary about the dinner; the zadcouskies [zakuski] were numberless, the sturgeon was excellent, but the rest was like what one would expect at any gentleman’s house. I had no difficulty in avoiding questions on occultism from Her Majesty–she hardly spoke, in fact she did not seem to notice me. She appeared very distraught, spoke of Alexis a few times to the Czar, and the moment dinner was finished she bowed to us in a very stately way and left the room. When we had finished our coffee and cigarettes, His Majesty said some words in Russian to the Minister–it was the only time I had heard Russian spoken all the evening, for the conversation had been entirely in English and French, and mostly in English. I did what I was told and soon found myself in a rather odd-shaped room alone with the Czar. This room was, I expect, his own private study, as it led into a very handsome bedroom which I could see through the door, and from it the Czar later came out with a large leather case in his hands. Taking a small key from the end of his chain, he opened the case, and to my amazement laid on the table by my side the identical sheet of paper with my own writing and numbers on it which I had jotted down in King Edward’s library, and had seen once again in my consulting-rooms in the hands of the man now sitting opposite to me. I gasped with astonishment. Yes, I did indeed remember. And I knew the words on the paper were the terrible words of impending fate. “Do you recognize your writing?” he asked. I gave the Czar my word of honour that I would not reveal what passed between us that evening in his study in the Summer Palace of Peterhof. Sufficient to say that he knew–that he was a fated monarch. He rose, we went out and joined Isvolsky on the terrace. Beneath us on the summer sea, the Imperial yacht lay like a painted toy, by my side stood His Imperial Majesty, the Czar of All the Russias, the Anointed Head of the Church and the “Little Father” of his people, and yet even then there were outward and visible signs that all was not right with the heart of Russia. A short time later I was awakened one morning in my hotel to be told by a police officer that on that day from nine o’clock until midday, no one would be allowed to look out of any windows having a view on the Nevsky Prospect. His Majesty the Czar was about to pass to dedicate the church built over the spot where his predecessor had been assassinated. On another occasion, a few months later, when the first snow of winter made the streets almost impassable, I met a procession of some fifty men with a few women handcuffed together being driven to a station to be entrained for Siberia. They had been arrested at their work, some were in shirt-sleeves, some in their overalls, but just as they were, they were being marched through the streets with the thermometer at 18 degrees below zero. As if it were a funeral that was passing, my droshky driver held his fur cap in his hand and made the Sign of the Cross–involuntarily I did the same. The Church of the Savior on Spilled Blood, built on the spot where Nicholas II’s grandfather, Czar Alexander II was assassinated, was finished–and I assume–dedicated in 1907, which gives us a probable date for Cheiro’s visit with the Czar and his predictions. There are some areas of concern. First, Cheiro leads off with “a London paper” noting that “when the Czar was in England, he frequently consulted the famous seer, ‘Cheiro,'” which does not exactly square with his having read Nicholas’s chart first for the Prince of Wales. If Nicholas “frequently,” visited the palm-reader, one would think that Cherio, as a man who, for professional reasons, would need to cultivate an excellent memory, would not have been surprised to find his mystery client of a year later was the Czar. Nicholas’s photograph was frequently in the papers and he bore an uncanny resemblance to his cousin George, later King George V, so unless he had a damned good disguise, his incognito visit to the palm-reader, if he made it at all, sounds unlikely. 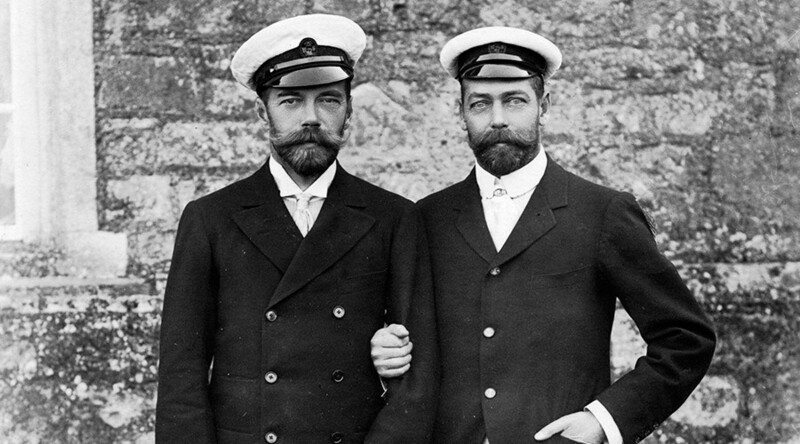 Cheiro and the Csar Csar Nicholas II and George, Prince of Wales, later King George V.
He also may have gotten his facts wrong when he claims that Nicholas hesitated about escaping with the Imperial family to England. Can Fate be averted?…The unhappy Czar of Russia might be said to be the sport of malignant Fate. As all the world knows, he had the inspiration that led to the Hague Conference and certainly dreamt of world-wide Peace. Yet his country fell a prey to anarchy, while he himself was foredoomed to a violent end. Nicholas himself seemed eager to flee with his family to an English exile. A rather reluctant offer of asylum was offered to the Imperial family, but was withdrawn as a politically inexpedient move–by King George V himself, say some historians. The ex-Empress was regarded as pro-German and there were also fears that the presence of the Romanovs in England would stir up violence from leftists and anarchists.